Did you know that octothorpe is the name of the # symbol on a phone? It doesn’t quite have the same ring to it as “hashtag.” Ladies, did you have a Barbie growing up? Did you know her full name is Barbara Millicent Roberts? So regal. Did you know there’s a town in Georgia named Santa Claus? A Monkey’s Eyebrow, Kentucky? And a No Name, Colorado? Names are a big deal. Branding companies make millions of dollars every year helping businesses come up with the right name. Expectant parents spend countless hours debating potential names for their kids. Imagine a world where no one had a name. Boring, right? And confusing. It’s almost as if our names carry the weight of who we are. be your name’” (Matthew 6:9). Just as a child can freely approach a good father, we can approach our perfect Father in heaven. The way we think about God affects how we approach Him. And the way we approach God is so important that Jesus began His prayer by mentioning it—approach God as your loving Father. It doesn’t mean you have to literally call him Father every time you pray. It means you simply acknowledge that God loves you and will respond to you like a loving father would respond to his children. Continue by honoring His name. 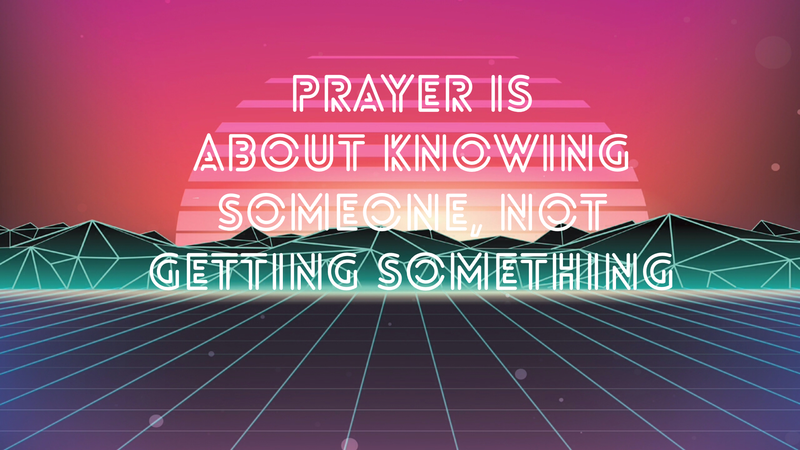 Prayer should start with God—not with us. God’s name carries a lot of weight. He deserves to be recognized and admired. Spend some time thinking about who God is before you starting telling Him everything you need. Prayer shouldn’t just be about us and our wish lists. Prayer reminds us who God is. Let’s take a few minutes and turn our attention to God. Today, when you spend some time in prayer, thank God for how awesome He is and for all the great things He has done. You might want to talk to Him about the things you wrote down, or read Psalm 96 back to Him.